Welcome to Geospatial for Java. This tutorial is aimed at Java developers who are new to geospatial and would like to get started. Please ensure you have your IDE set up with access to the GeoTools jars (either through maven or a directory of Jar files). For those of you using Maven we will start off each section with the dependencies required. This workbook is once again code first giving you a chance to try the concepts out in a Java program and then read on for more information if you have any questions. This workbook covers the handling of GridCoverages (in the rest of computing these are known as rasters or bitmaps). The idea is that a coverage completely covers the surface of a map with no gaps forming a surface. A grid coverage is a special case of a coverage in which all the features end up as small rectangles on the surface of the earth. This idea is so similar to our concept of pixels we end up using a lot of the same file formats to represent a grid coverage in our computing systems. In the earlier examples we looked at reading and displaying shapefiles. 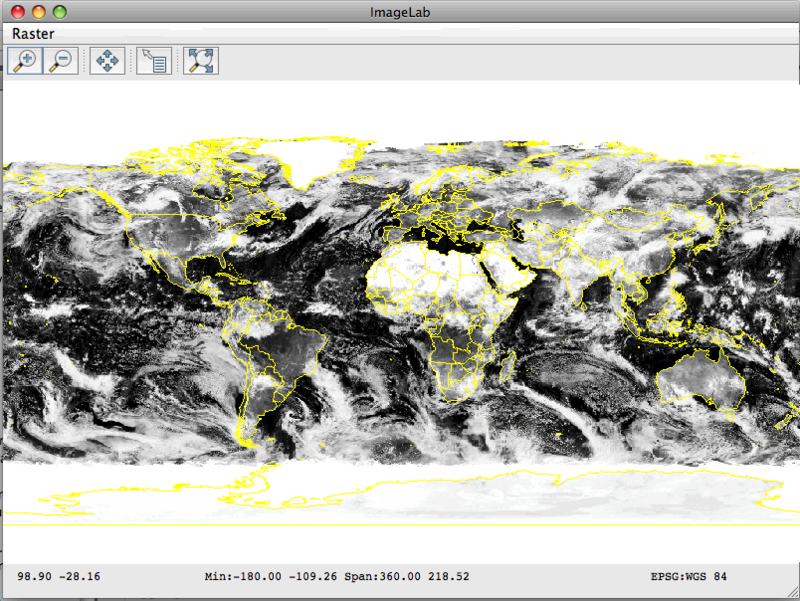 For ImageLab.java we are going to add raster data into the mix by displaying a three-band global satellite image, and overlaying it with country boundaries from a shapefile. Please ensure your pom.xml includes the following. We have already encountered most of these dependencies in earlier examples. The new modules we have added are gt-geotiff which allows us to read raster map data from a GeoTIFF file and gt-image which allows us to read an Image+World format file set (e.g. jpg + jpw). One thing that has been a mystery until now is how the DataStore wizards are created. The wizards are created from a description of the parameters needed when connecting. a Map containing additional data for the Parameter - in our case this is one or more file extensions. To display the map on screen we create a MapContent, add the image and the shapefile to it, and pass it to a JMapFrame. Rather than using the static JMapFrame.showMap method, as we have in previous examples, we create a map frame and customize it by adding a menu to choose the image display mode. // Finally display the map frame. // When it is closed the app will exit. Creating a greyscale Style prompts the user for the image band to display; and then generates a style accordingly. * Create a Style to display the specified band of the GeoTIFF image as a greyscale layer. * displayLayers() method when the application first starts. To display color we need to use a slightly more complex Style that specifies which bands in the grid coverage map to the R, G and B colors on screen. The method checks the image to see if its bands (known as sample dimensions) have labels indicating which to use. If not, we just use the first three bands and hope for the best ! * symbolizer and returns this wrapped in a Style. // We examine the band names looking for "red...", "green...", "blue...". // Note that the channel numbers we record are indexed from 1, not 0. // If we didn't find named bands "red...", "green...", "blue..."
Please note that the above technique (checking colour bands) is specific to RGB images. While this is easy for a simple color image; it can be harder for things like satellite images where none of the bands quite line up with what human eyes see. When you run the program you will first see the wizard dialog prompting your for the image and shapefile. The initial map display shows the image as a greyscale, single-band view. Experiment with displaying different bands in greyscale and swapping to the RGB display. Modify the file prompt wizard, or the menu, to allow additional shapfiles to be overlaid onto the image. Add a map layer table to the JMapFrame using frame.enableLayerTable(true) so that you can toggle the visibility of the layers. Advanced: You can also use GeoTools to work with raster information being served up from a remote Web Map Service. *    version 2.1 of the License. *    Lesser General Public License for more details. * This is a Web Map Server "quickstart" doing the minimum required to display something on screen. * contents on the screen in a map frame. Support for raster data is provided by the concept of a GridCoverage. As programmers we are used to working with raster data in the form of bitmapped graphics such as JPEG, GIF and PNG files. On the geospatial side of things there is the concept of a Coverage. A coverage is a collection of spatially located features. Informally, we equate a coverage with a map (in the geographic rather than the programming sense). A GridCoverage is a special case of Coverage where the features are rectangles forming a grid that fills the area of the coverage. In our Java code we can use a bitmapped graphic as the backing data structure for a GridCoverage together with additional elements to record spatial bounds in a specific coordinate reference system. A normal image format like jpeg or png that has a side-car file describing where it is located as well as a prj sidecar file defining the map projection just like a shapefile uses. A normal tiff image that has geospatial information stored in the image metadata fields. This is generally a safe bet for fast performnace; especially if it has been prepaired with an internal overlay (which can be used when zoomed out) or internal tiling (allowing for fast pans when zoomed in. Performs best when your computer has faster disks than CPUs. The sequel to jpeg that uses wavelet compression to handle massive images. The file format also supports metadata fields that can be used to store geospatial information. This format performs best when you have more faster CPUs than disk access. There are also more exotic formats such as ECW and MRSID that can be supported if you have installed the imageio-ext project into your JRE. Another source of imagery is a Web Map Server (WMS). The Web Map Server specification is defined by the Open Geospatial Consortium ‐ an industry body set up to encourage collaboration on this sort of thing. The trick is knowing what parameters to fill in for “ layer ” and “ style ” when making one of these requests. The WMS Service offers a GetCapabilities document that describes what layers are available and what other operations like GetMap are available to work on those layers. GeoTools has a great implementation to help out here ‐ it can parse that capabilities document for a list of layers, the supported image formats and so forth. The WebMapServer class also knows how to set up a GetMap request for several different version of the WMS standard.